How many names/faces can you recognize? 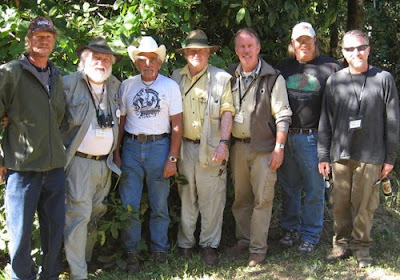 This past weekend, I had the pleasure of attending a gathering of a virtual "who's who" of bigfooters at a private property out in the Coast Range of Oregon. The gathering, officially named "Beachfoot," was organized by Todd Neiss and his wife, Yvonne. 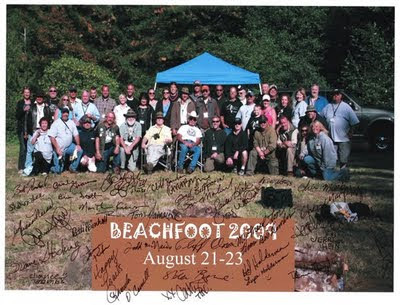 It was an intimate gathering of bigfooters, witnesses, and aficionados invited from coast to coast. There were a few speakers, and we did a little squatching in the woods at night, but it was a largely social affair, and an excellent time. I arrived at the property where this event was held on Friday evening after battling traffic trying to escape the Portland metro area during rush hour. My friends Tom Yamarone, Paul Graves, and Bob Gimlin saved me a spot next to theirs, and I arrived just in time for buffalo meat burgers and vegetables grown on the Gimlin homestead in Yakima, WA. That night was spent catching up with old friends, meeting a few new ones, and reestablishing relationships with folks I had not seen in person for a while, and in a few cases, ever. There were too many people there to mention, but among the more familiar names in attendance were Chris Murphy, Joe Beelart, Cliff Olsen, Orey and Steve Iness, Diane Stocking, Craig Woolheater, Ron Morehead, Tom Yamarone, Thomas Steenburg, Dr. Robert Pyle, Autumn Williams, Todd Neiss, and Peter Byrne. Music was in the air, as should be expected with Tom Yamarone in attendance. Paul Graves also has a number of bigfoot songs in his repertoire, which he was happy to share with the smiling crowd. However, I did not know that Ron Morehead can play guitar and has a voice reminiscent of Elvis Presley. I guess I could have known this by listening to the Sierra Sounds CD's, one of which he narrates. John Kirk also got a chance to pluck some guitar strings throughout the night. I do have to give special musical kudos to Autumn Williams on her lovely singing voice. I had no expectations, but it turns out I was pleasantly surprised at her soulful, clear singing on such a classic as "Summertime." 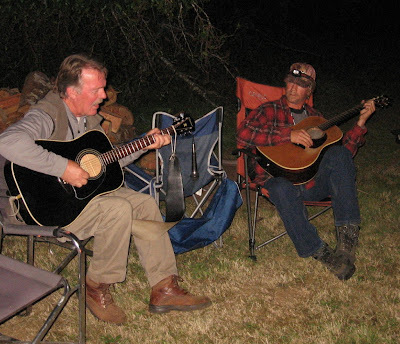 Ron Morehead and Paul Graves crooning tunes in the night. Saturday morning came too early (or was the previous night too late? ), but I awoke to my favorite kind of "alarm clock": Bob Gimlin crawling out of his nearby tent and remarking to himself, "What a beautiful day!" With this kind of welcome to a new day it's hard to not have a smile on one's sunned face all day long. After breakfast, Thomas Steenburg was scheduled to give a short presentation on recent happenings up in his neck of the woods in British Columbia. He told of his investigations and of a recent flap of hoaxing that seems to be rampant in Western Canada. After lunch, forensics expert John Cordell gave a concise presentation on investigative techniques. 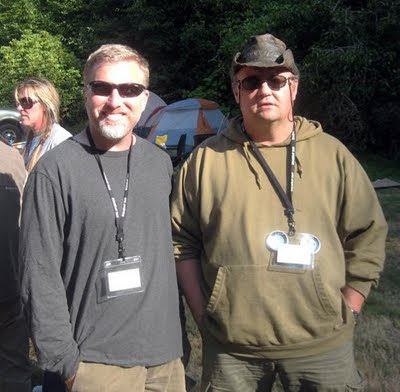 John had contacted me close to a year ago about an investigation I did on nearby Gordon Creek, so it was great to finally meet him in person to talk about that report and others. He is a professional through and through, and one I hope to get a chance to work with again. After a communal barbecue, Ron Morehead spoke about the Sierra Sounds recording, but it was originally Scott Nelson who was scheduled. Scott could not make it due to professional obligations, but Ron did his best to fill us in. I always enjoy hearing Ron's thoughtful recounting of his numerous encounters, and his interpretations thereof. Ron, as well as all in attendance, truly respects the 'squatch. As it turned out, the event happened to be on the same weekend as the birthday of Peter Byrne. Peter's name should be familiar to anyone who has done much reading of bigfooting history, having been investigating reports of hairy bipeds for more than half a century. He is now living on the coast of Oregon, and he continues to search for evidence of sasquatches, but also spends time in Nepal working for the International Wildlife Conservation Society, which he founded. What a dapper looking cake! Later, Dr. Robert Pyle said a few words and did a short reading from his fantastic book, after which we were set loose to socialize and play music (even I sat in on the song, "Bigfoot and Butterflies" by Paul Graves, sung for Dr. Pyle, whose specialty is butterflies). The next morning I again awoke to my Gimlin alarm clock, and sure enough, he was right: it was another beautiful day. We ate a communal breakfast of fruit, eggs, and rolls while we socialized and shared thoughts and stories of our various adventures. Soon, goodbye's were said, and we were off to the various places from where we had come, yet a little richer for the experience. 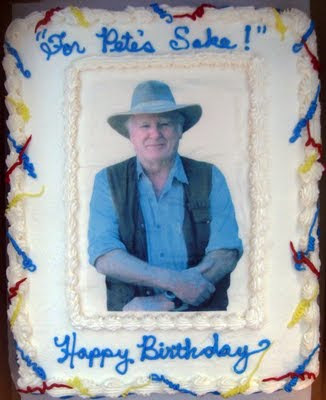 I'd like to end this post by wishing Peter Byrne a happy birthday, but more importantly, a happy year to come. His contributions to bigfooting speak for themselves, and it is the shoulders of Peter and the other "horsemen" that we all stand on now.